The Kia Rio is a smart subcompact car manufactured by Kia (South Korea) and now available in Sri lanka. This is Kia Rio Sri lanka Price Rs 4.49MN. Kia Rio 2016 four door sedan offer smarter features for your ever day life. 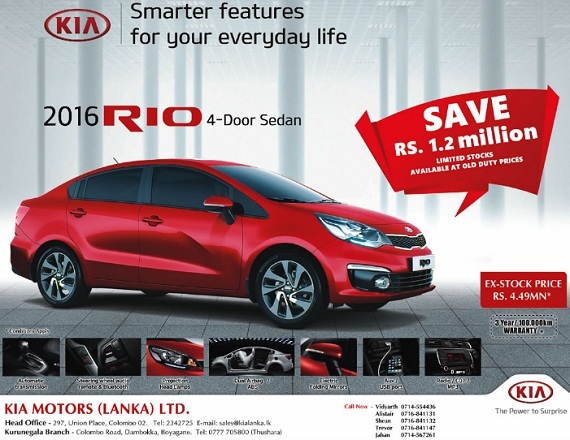 Kia Rio Car marketed by KIA Motors (Lanka) Limited and limited stocks available at old duty prices. KIA Motors offering three year or 100000 Km warranty for Kia Rio car in Sri lanka. Kia Rio car has good second hand value and due to that reason most of the people looking for kia car sale in sri lanka.